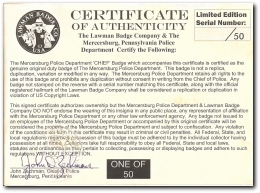 Mercersburg, PA Police Chief has released to Collectors this badge from this very historic part of the US. The Chief wanted to pattern it after a Boston Police badge. We tried to take it a step further and it looks magnificent. This badge is done in antique silver (OFFICER) and antique Gold (CHIEF) finish to bring out the high relief of the historic buildings. It is a heavy gauge high quality badge with our Lawman hallmark, safety catch and serial number on the reverse. This is the Department issue duty badge currently worn by Mercersburg Police Department. Mercersberg Borough was incorporated in 1831. It is the birthplace of our 15th President James Buchanan. He was born in a log cabin marked by a monument in the State Park on the campus of the prestigeous Mercersburg Academy, (building with steeple). The 'Borough Hall' (other building on badge) was built in 1904 and housed the Police Department/Fire Department until the late 1920's. The Police Department still resides at the Borough Hall location and the image is on their shoulder patch. ► A Unique and Beautiful Custom Duty badge made from the highest quality materials.